Horror director George A Romero reveals why he made his latest zombie film - and why the undead can't run. 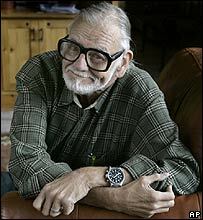 When it comes to zombie movies, there is no man more revered than George A Romero. Made for just $100,000 in black-and-white, his 1968 film Night of the Living Dead became a cult classic that spawned an entire genre. It also generated four sequels, the latest of which, Diary of the Dead, is released in the UK this week. Laden with gore, blood and apocalyptic doom, Romero's work is not for the faint-hearted. Alongside the carnage, though, the 68-year-old director presents a telling and often satirical commentary on American society, culture and politics. "All these films have been motivated by observations of what is happening out there in the world," he explains. "If you look at the films in sequence, they reflect 40 years of what was happening in North America." In 1978's Dawn of the Dead, for example, the shopping mall setting enabled Romero to allude to the dangers of rampant, soulless consumerism. Land of the Dead's vision of a US metropolis under siege, meanwhile, can be read as a parable about America's post-9/11 isolationism and paranoia. So what was the thinking behind Diary of the Dead, which follows a group of film students documenting a zombie attack? "I wanted to do something about emerging media," says the director, citing the phenomenal success of video sharing website YouTube. "All of a sudden we're all somehow electronically connected to one another." Diary, of course, is not the only picture this year to present its escalating horror from the point of view of a camera-wielding observer. Recent monster epic Cloverfield utilised a similar technique, while Brian De Palma's upcoming film Redacted - about US soldiers stationed in Iraq - is entirely made up of so-called "found footage". "We thought we were going to be the first ones out there," says Romero. "But now we have to settle for being part of a trend. I guess there must be some sort of a collective subconscious." Some critics have been less than kind about his latest effort, though that has not stopped the director putting a follow-up into development. Suggest he has the artistic monopoly on this bleak horror sub-genre, though, and he is quick to demur. "My work is my work, and I don't particularly care what other people are doing," he says. "But I certainly don't think of my films as being more pure than the others." On one matter, however, he is prepared to take a stand - the vexed question on whether zombies can run. It all started with 2002 British movie 28 Days Later, in which a mystery virus turned people into shrieking, sprinting banshees. 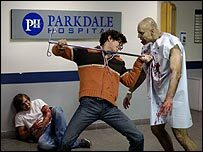 The zombies in the Dawn of the Dead remake of 2004 were no less active - an acquired characteristic Romero, who did not direct the film, has strong opinions about. "Zombies don't run," he states firmly. "They can't! Their ankles would snap. "What did they do - wake from the dead and immediately join a health club? I don't get it." Aficionados will be happy to hear that the zombies in Diary of the Dead conform to the usual shuffling, stumbling stereotype. It will also no doubt tickle them that Romero has taken pains to devise new and inventive ways of despatching them. "Every time I do one of these, I spend all my time in the shower thinking how I'm going to knock these guys off," he laughs. "That's where the applause comes from in my films - good zombie kills!" George A Romero's Diary of the Dead is out in the UK on 7 March.